The health benefits of the bottle gourd are manifold. It is not only nutritious but is also a wonderful cooling vegetable that can really help you fight the hot summer months. And that’s not all. Bottle gourd juice has been traditionally used for many years for treating many bodily disorders. 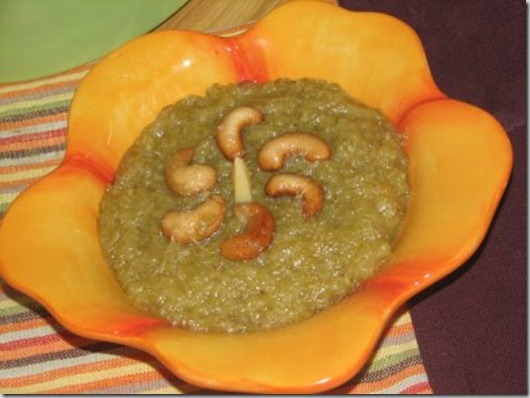 Here is a wonderful recipe of loki ka halwa by chef Zakir. Take a pan put grated bottle gourds with little water and boil it. Now take another pan and heat ghee in it. After that put boiled bottle gourd, sugar and cook well. After that add khoya in it and cook for 3 minutes. In the end, put almonds and pistachio and cook it for 5 minutes and serve it.